Claude Monet’s “Pathway to the garden” by Maureen Megowan. If you look at a picture of a dining room without knowing what is served there, you will make judgements about the place from the décor. Paper napkins and bare formica say you’re in a diner, white cloth napkins and tablecloths make you expect classic cuisine, and black table dressings with patterned napery say you’re in someplace more edgy. Artfully arranged flowers in a nice centerpiece say it’s a special occasion, and we expect a meal there to be memorable. Most of us don’t think much about how this works when we’re entertaining at home, though we should. A little attention to the table shows that we value our guests, and it shows the host’s good taste in the process. This kind of thing can be taken to another level, as demonstrated on October 25th at the Candalistas “Art Inspired Entertaining” event at the Norris Pavilion. The centerpiece of the event, literally as well as figuratively since it took up the center of the ballroom, was a display of tables set for dinners that wouldn’t actually be served, at least on that particular day. 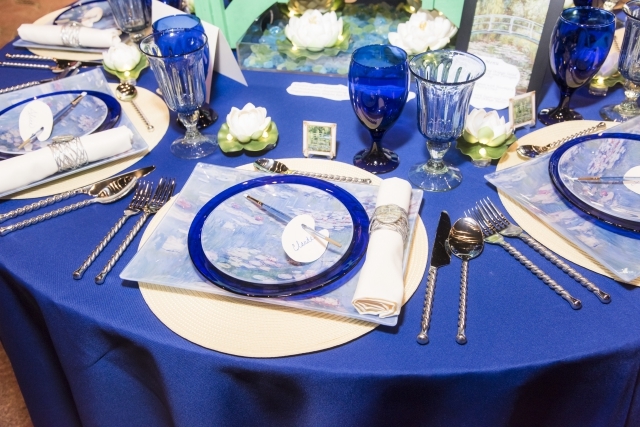 Those decorated tables are always a feature at the Candalistas’ fall fundraiser, just as they are at county fairs and other civic events, but in this case, there was an unusual theme: table settings inspired by art. The intention wasn’t to create a table that Rembrandt, Matisse, or Edward Hopper ever actually dined at, but to evoke their work in the way the table was laid out and decorated. Debbie Sampson, a former president of Candalistas, decorated her table in the style of Van Gogh’s 1889 painting of irises. Atop a deep purple tablecloth, plates that resemble curling leaves sat atop ornamented mirrors, and an actual iris was ringed alongside each place setting and inside a glass vase in the center of the table. Smaller details that carry the theme abound, like the iris-print napkins and scarf beneath the centerpiece. As Debbie explained it, as soon as she knew the theme, she knew what she was going to do. The combination of collected and handcrafted elements comes together to create a serene, majestic look, and it was natural to ask whether she ever sets the table like this for her own gatherings. Susan Haas’ and Janie Woodburn interpretation of marine artist Wyland. Interior designer Konni Tanaka picked a colorful piece to reference in her table, Henri Rousseau’s 1910 “Apes in the Orange Grove.” The painting is serene and enigmatic, and Konni’s reflection on it uses the colors in the original with only one direct reference – placemats with prints of monkeys. There were jungle ferns in the tall centerpiece, but also flowers from more temperate climates. When this was mentioned, Konni pointed out that this contradiction was in the original picture too. When asked whether the tall centerpiece would make conversation with anybody across from you impossible, Konni explained that this is part of the aesthetic of table dressing displays. 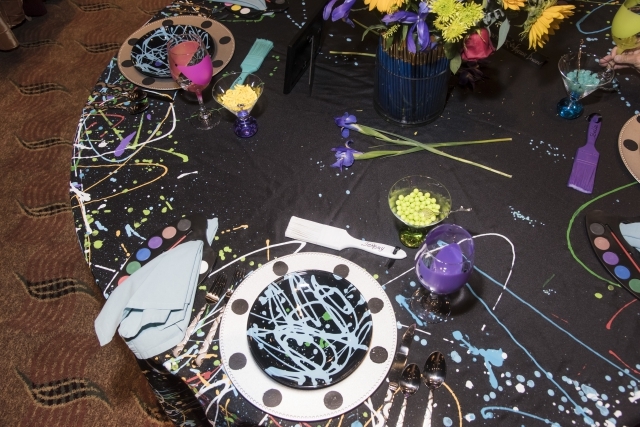 Creativity was on full display at a neighboring table by Freddie Benson that featured loops, swirls, and drips of paint in the style of abstract expressionist Jackson Pollock. A black tablecloth was enlivened with streams and swirls of dazzling color, as were the plates, and a centerpiece used artist’s brushes as a cage for flowers. Though her evocation of Pollock was effective, Freddie’s attitude toward the artist was, to say it mildly, different from the reverent respect that most expressed for their muses. Jackson Pollock inspired table design by Freddie Benson. 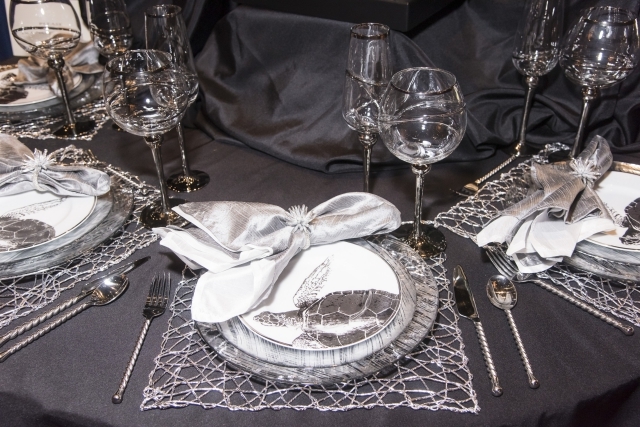 Freddie is a newcomer to table setting as an art but has plenty of related experience. Elaine Trutanich, whose table was a homage to Pablo Picasso, is a veteran, as she has been displaying table designs for years at events like St. Francis Episcopal Church’s “Designs For Dining.” Here she evoked the 20th century master with a design that had a simple white tablecloth and an unlabeled wine bottle that brought out his humble origins, but also had gaily painted chairs with a pair of painted guests sitting across from them. She found Picasso to be an appropriate subject because the artist was no stranger to the kitchen and had a sense of whimsy about food. Elaine said that the decision to use the artistic theme had spurred her to greater creativity as opposed to past years. A Mozart inspired design featured a piano in the center of the table. That question had been answered to some degree in each display, some of which had been assembled from off-the-shelf items while others obviously involved a great deal of handiwork. The goal here is to show good taste and sense of proportion as well as cleverness, and there were some surprising realizations of concepts. 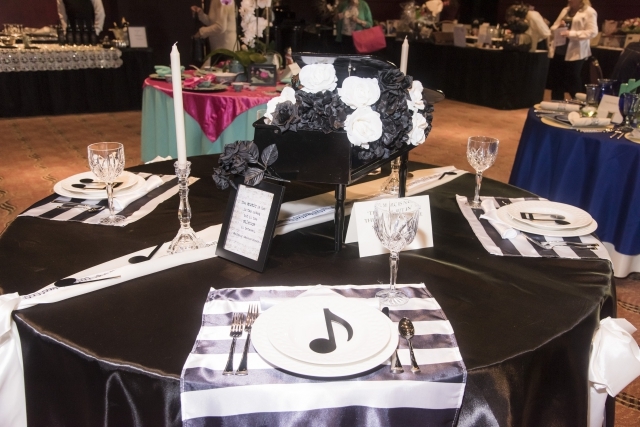 A table themed around the music of Mozart had a miniature piano as a centerpiece and striped napkins that brought to mind music paper, and one themed around “American Gothic” balanced Early American folk-art ideas with more dramatic backgrounds. A mood was set at each table, whether overtly or subtly, and even a casual viewer came away with a new respect for how a well-set table might change or enhance your expectations of a meal.